Can energy price caps ever work? Last week the Conservative Party has announced a manifesto commitment to an energy price cap, despite warnings from across the industry, including in this blog, that the idea is unlikely to work, and may have significant unintended adverse consequences. In his recent address to Centrica shareholders, Iain Conn made reference to failed caps in New Zealand and Spain, and I have previously written about the disastrous price caps in California in the early 2000s. Since de-regulation, many markets have seen prices rise, leading to consumer pressure for action. The question is whether this is a result of imperfect competition allowing utilities to exploit their market power at the expense of consumers, or whether other factors are in play. 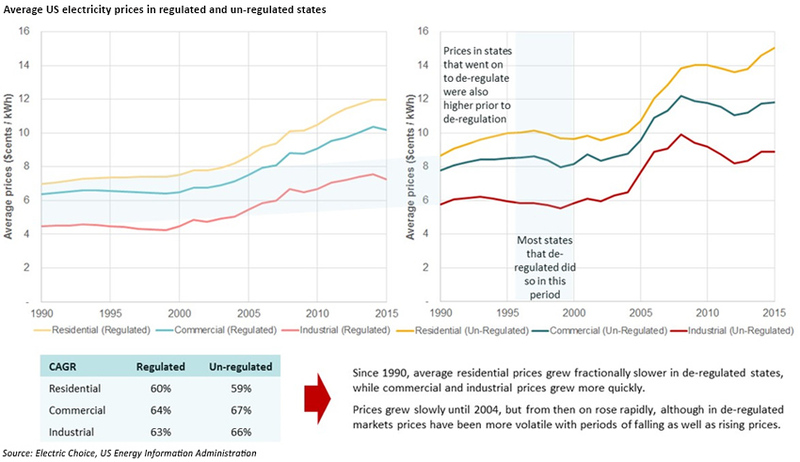 This study of US electricity prices by William B. Marcus, Principal Economist at JBS Energy, Inc. discussed the impact of de-regulation and found that although electricity prices were higher in de-regulated states than regulated ones, much of the difference was accounted for by the costs of deregulating. “We argue that the greatest political motivation for restructuring was rent shifting, not eﬃciency improvements, and that this explanation is supported by observed waxing and waning of political enthusiasm for electricity reform. This paper by Georgetown University School of Law discussed some of the reasons why electricity de-regulation has been less successful than the de-regulation of other industries such as telecoms. “The biggest flaw behind electricity restructuring was likely the belief that electricity markets can function competitively and efficiently to meet consumer needs in the short- and long-term without taking into consideration changes in market conditions and inevitable government intervention. Turning to GB, it is clear that the electricity market is failing. In well-functioning markets, competition delivers value to consumers, and price signals drive construction of new capacity, however despite the availability of more attractive tariffs, many consumers continue to pay the most expensive rates. Price signals have failed to deliver new generation capacity leading to wide-spread subsidies for new technologies and capacity auctions for traditional technologies. In fact the GB electricity market cannot be described as “de-regulated” in the traditional sense since a significant degree of re-regulation has occurred. Successive governments have pursued decarbonisation policies that have imposed significant additional costs to the system both in the form of generation subsidies and transmission reinforcement. In addition, as energy and balancing market prices do not reflect the full costs of delivering electricity in all periods, they fail to deliver the necessary investment signals to incentivise new generation, requiring further intervention in the form of the capacity market. Rising wholesale prices and the increasing costs of government environmental and social policies are resulting in significantly higher retail prices. Suppliers offer a wide range of tariffs, with discounts to attract customers away from competitors, yet despite these incentives, many customers fail to switch and find themselves on the most expensive rates. But imposing price caps is unlikely to deliver better value to consumers. Setting a relative price cap to prevent some consumers from paying “over the odds” will lead to a narrowing of the price differential between the highest and lowest tariffs, with currently active consumers effectively subsidising inactive consumers. But while a relative price cap is unlikely to work, an outright price cap risks causing significant damage. “…in a market where demand is volatile, or at the very least uncertain, it may be very challenging for the regulator to devise a cap, to apply in advance over an extended period (e.g. two years), in ways that limit the risk of serious errors. Energy producers might be expected to increase output and lower prices to avoid being capped. If absolute price caps are set too high, they are ineffective; if they are set too low they can cause chaos as was the case in California. In the worst case, suppliers go bankrupt and require government bail-outs, but they also act as a dis-incentive to new entrants who may lack confidence in earning acceptable returns, hence stifling competition. If the level of the cap is too low to cover the actual cost of generation and delivery of electricity, it is essentially a consumer subsidy, which can further distort markets and stimulate demand. The only rational justification for retail price caps is if there is evidence of suppliers earning excess returns by overcharging consumers, which itself would be evidence of market failure through imperfect competition or collusive behaviours. The recent CMA study found no such evidence, and did not propose price caps outside the narrow segment of pre-payment customers. This means there are other causes of high prices, which are, as I have illustrated in previous posts, rising wholesale prices and rising costs of decarbonisation and social policies. The lack of transparency creates difficulties in understanding the true drivers of prices, as does the complex web of generation subsidies. Adding consumer subsidies into the mix is highly unlikely to improve matters. Require greater transparency and simplification of tariffs by suppliers, and the standardisation of standing charges (while allowing suppliers to offer tariffs that combine a fixed and floating element, these should be clearly and accurately described which does not appear to be the case currently). These changes would result in a major simplification of bills for consumers and enable them to see how what they pay relates to the costs of generation and transmission. Tariffs could be designed to look like short-term mortgage products with consumers paying a spread over wholesale prices, with added features such as fixed or capped price offers for certain periods. The next government needs to act to reduce the distorting effect of energy policy on the markets – retail price caps are unlikely to work and will make a failing market perform even worse. On 2000-01 California faced two simultaneous energy crises – a supply crisis and a financial crisis, the latter being entirely self-made, as retail prices were capped a levels that ended up being below the wholesale market price as rising electricity demand and an absence of additional supply pushed up wholesale prices. As a result, the balance sheets of the main utilities, PG&E and Southern California Edison became seriously eroded and their credit rating deteriorated to a point where generators were unwilling to sell to them. At that point the state had to step in and act as the sole buyer for electricity on behalf of the utilities. "Thus the problem in California was not electricity deregulation; it was price regulation at the retail level and rigid regulation prohibiting long-term contracts at the wholesale level. It was an issue of gross mismanagement by the California governor and the CPUC,"
- James L. Sweeney, “The California Electricity Crisis: Lessons for the Future"
The state was forced to intervene aggressively in the electricity market, imposing significant price increases on consumers, and instituting a rebate scheme for consumers who reduced consumption by at least 20% from summer 2000 levels. The state also entered into US$ 40 billion of long-term electricity contracts at prices that were expected to be more than 50% above future spot prices. The overall cost to consumers ran into billions of dollars. In 2002 the government of Ontario responded to consumer pressure relating to high retail electricity prices by imposing a cap. This cap affected only retail prices and was retroactive, meaning consumers received a rebate for electricity purchases for the previous six months. Dewees goes on to describe the unintended consequences of the cap: firstly it discouraged electricity retailing since it was impossible to be profitable given the level of the cap; secondly it discouraged electricity conservation since it removed price as a means of restraining demand, and thirdly, it dis-incentivised investment in new generation as investors doubted that the government would continue to support the cap. The scheme lasted until 2005 when it was replaced with regulated prices for retail customers which removed the subsidy again required consumers to pay the actual cost of electricity. just forget de-carbonisation as government policy. Oil and coal will run out eventually, and then the market will adapt.